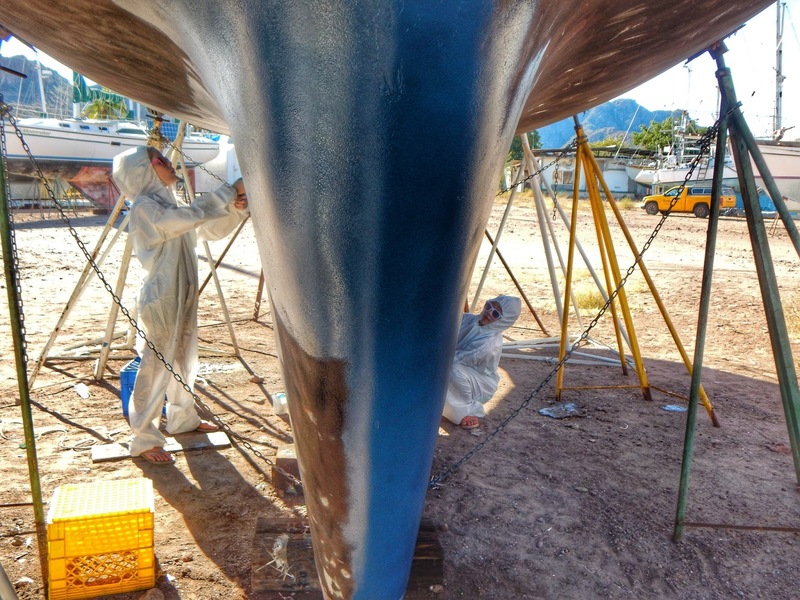 A boatyard represents two things; a place where dreams come to die or a place that fosters promises and progress. Thankfully for us, being reunited with Terrapin after 7 long months meant it was time to get busy on progress with the promise of crossing the Pacific in a few weeks. This was our first time actually staying on the boat while it was on the hard, and every minute sucked just as we had anticipated. Marina Seca Guaymas is all dirt, actually it's more like grit, and with a steady cold wind of at least 20 MPH there was no escaping being covered in it. 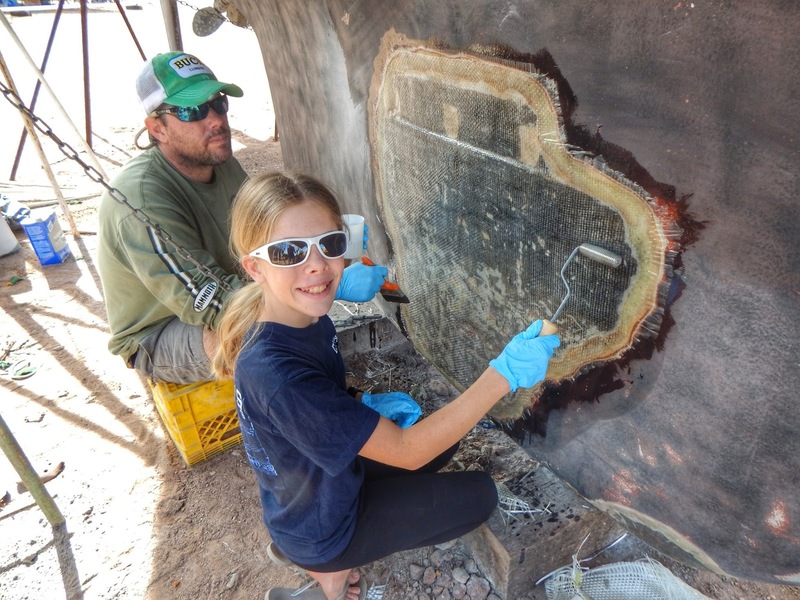 First item we worked on was the blister (read: crater) we discovered on the keel. 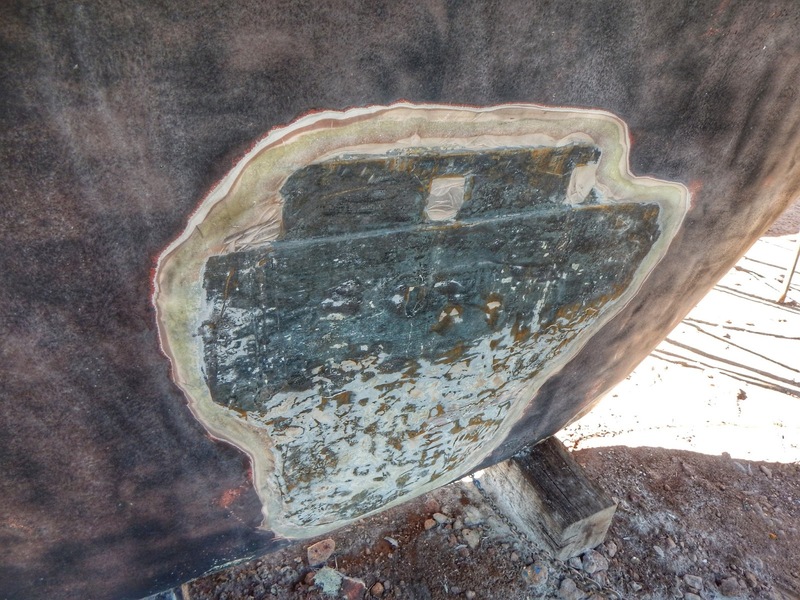 With a little help from the dirt dwellers in the yard we were able to get our delamination issue resolved in a few days. We had brought from the States 5 gallons of bottom paint, all of which we applied ourselves. 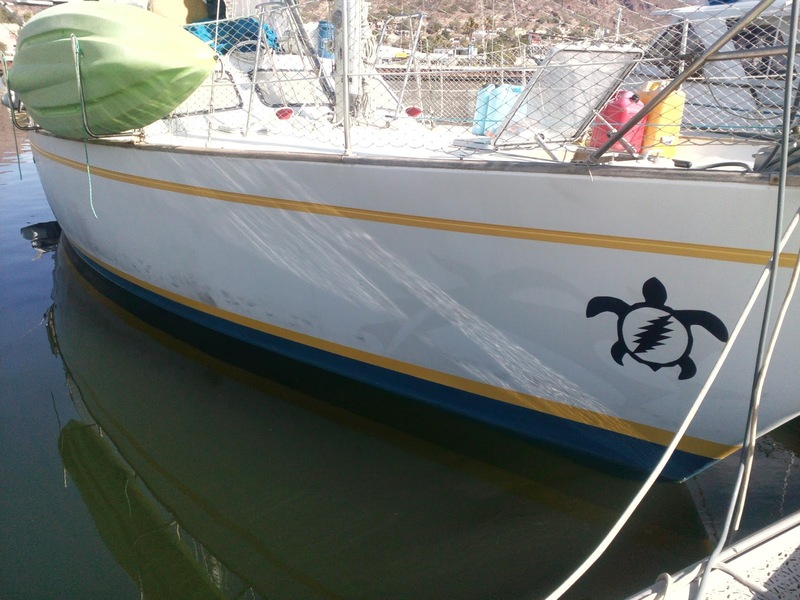 With a new bottom paint color applied, I couldn't help but think that Terrapin needed a new sassy color on the boot stripe and applied a little ray of what I like to call "sunshine" to her hull. 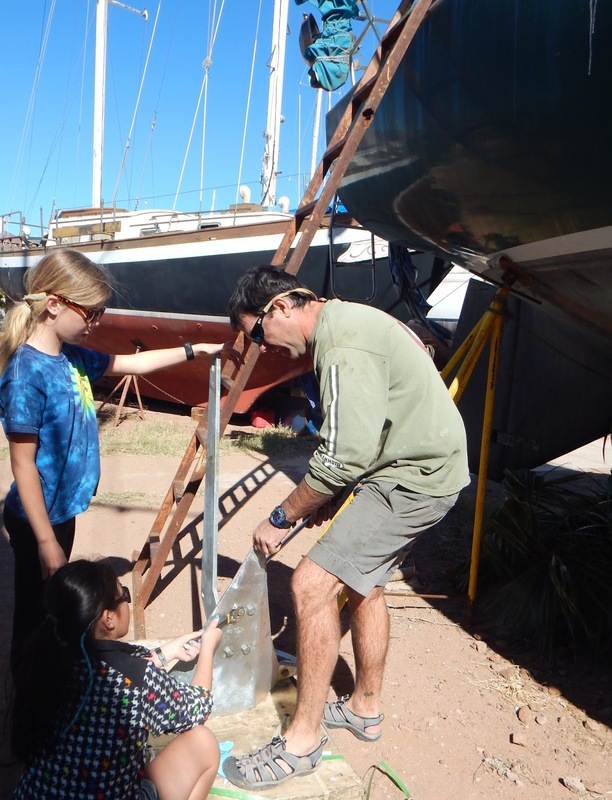 In between paint and epoxy we put together our new 88 pound MANTUS anchor. 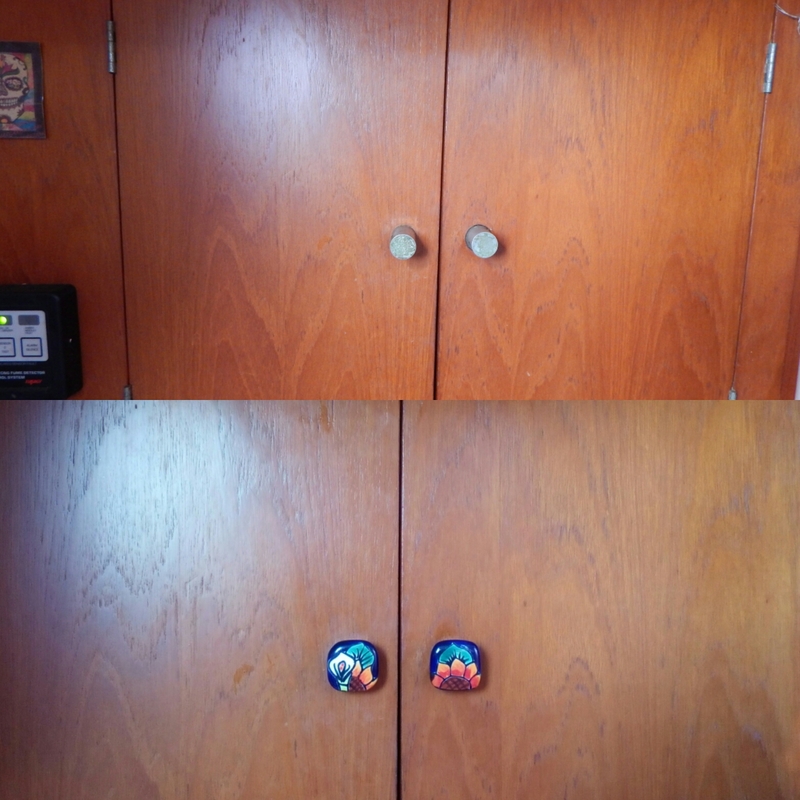 So happy about my new Mexican ceramic knobs. 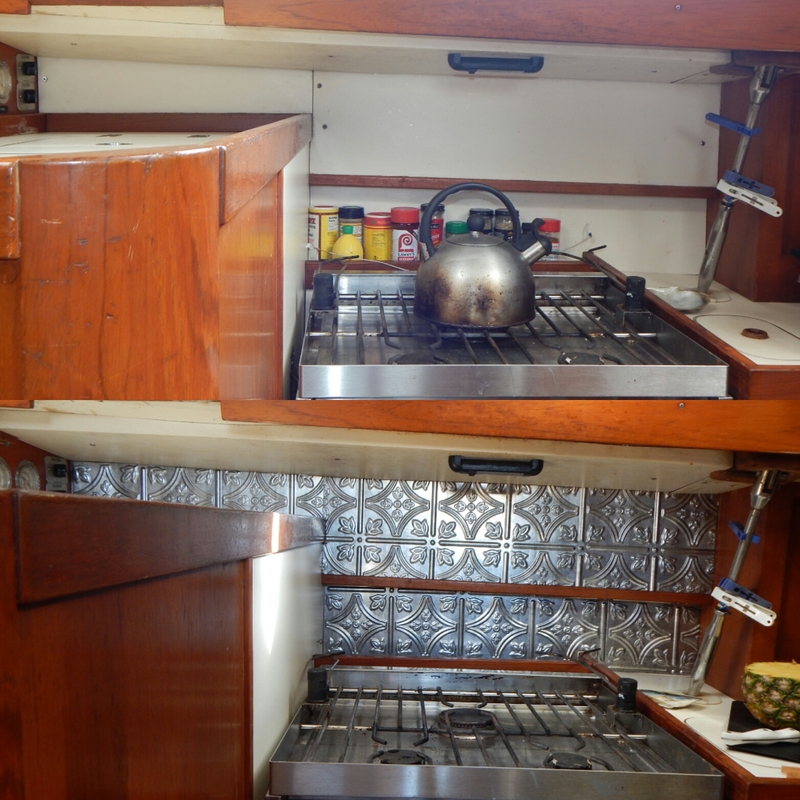 An inexpensive project that made a huge difference was applying faux tin backsplash from Lowes. 20 minutes and less than $40 later. Want to instantly feel 20 years older? 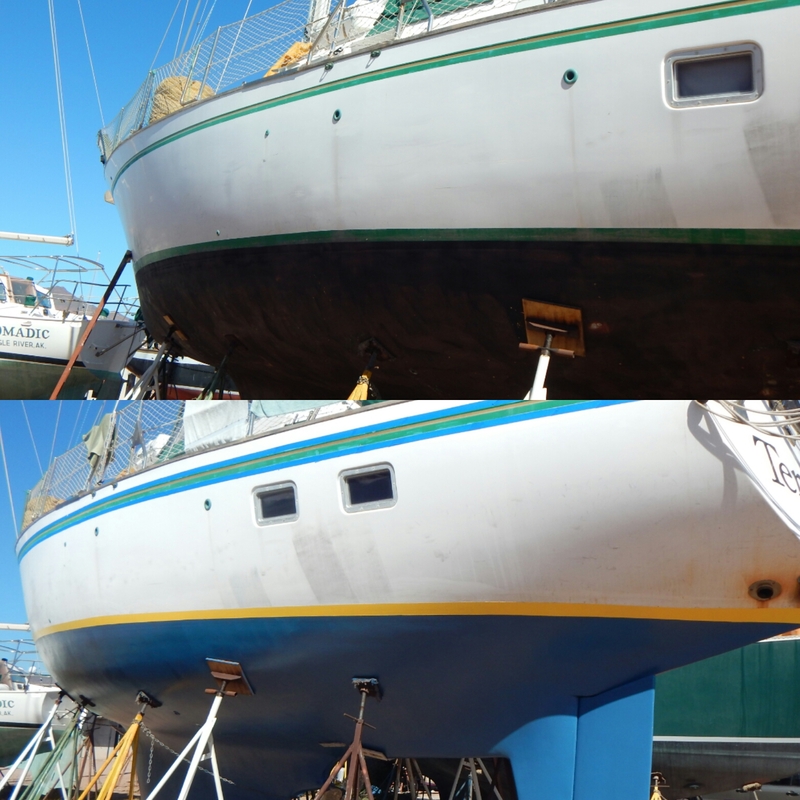 Resurrect a boat that has been sitting on the dirt for 7 months with a self generating 'to-do list', while continuously climbing up and down the tallest ladder in the yard (13 feet). For 12 consecutive days we felt trapped in either an Aleve or arthritis commercial. Each day ended the same by literally crawling into bed by 8pm, laying there, grousing. "I haven't been able to feel my lower back since Monday." "I'm going to have a limp tomorrow. That's if I can ever walk again"
"Not sure what you're bitching about. My left hand looks like a club. After two solid days of painting while clinging to a ladder, I can't open my hand." "If tomorrow I can't remember my name and I drool on myself, I'm blaming the fumes from the past few days." "Jesus Christ I feel old." We survived, we conquered, heck we even accomplished all of our "to-do" list and then some. We even survived the freakishly cold winds that blew morning, noon and night. I survived climbing up and down the ladder in the middle of the night to head to the ladies room while the howling wind attempted to blow me off the boat. We are back in the water and headed to La Cruz this Monday! Love the new paint job! You girls do good work! One day ,i too will sail the open waters!!! One day,i too will sail the open seas!!!! The backsplash is spot-on. What a difference!